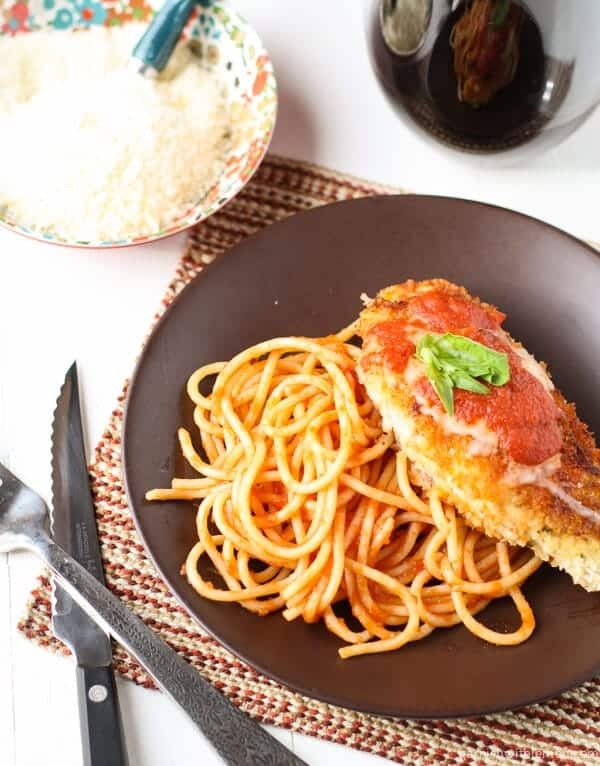 Jazz up your Valentine’s Day dinner with a simple and delicious Chicken Parmesan that can be on the table in 30 minutes! Chicken Parmesan is always one of my favorites on an Italian menu. Problem is, there are a lot of BAD ones out there. They are either too saucy, have too much batter or have mushy chicken. I know, picky, right? But really tasty Chicken Parmesan is super easy to make at home when you have a good recipe. And it can be on the table in 30 minutes. Have I piqued your interest yet? We have had this Chicken Parmesan in our regular rotation of meals for years. After trying several versions and continually being disappointed, I found this gem of a Cooking Light recipe and have never looked for back. I love that it is prepared with a combination of frying and baking. I still get the crisp outside from frying with the health benefits of baking. Super important to me since mushy or greasy Chicken Parmesan just doesn’t cut it in my book. The Chicken Parmesan is even easy enough to make for a weeknight dinner. Perfect for those nights you need some good hearty food to warm the soul (we have had a lot of those nights this winter, and it’s only the beginning of February). But it’s also special enough to serve entertaining guests. How’s that for versatile? Juicy chicken, a crispy coating and just the right amount of sauce and cheese. Add a salad and some crusty French bread, and dinner is served. 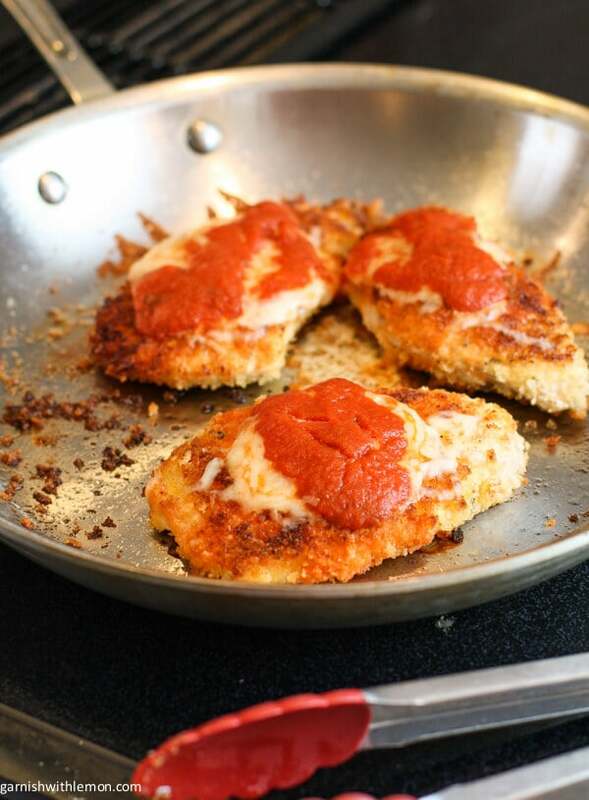 A simple and delicious Chicken Parmesan that is done in 30 minutes. You will need 3 shallow bowls. In the first one, combine flour and oregano and add salt and pepper to taste. In the second one, place beaten egg. And put panko in the third. Dredge chicken, one piece at a time. Start with flour mixture, then dredge in egg, and lastly, dredge in panko crumbs. Using an oven safe skillet, heat 1 tablespoon oil over medium-high heat. When pan and oil are hot, add chicken and cook for two minutes. Add the remaining tablespoon of olive oil, flip chicken and cook for another 2 minutes. Spray the top of chicken with cooking spray (I use an olive oil mister) and place in oven. Bake for 5 minutes. Turn chicken over and top each piece with 3 tablespoons mozzarella and 2 tablespoons sauce. Bake for 5 more minutes or until chicken is done. Serve with pasta and additional sauce. You are making me hungry at 8:30 in the morning! I love a good chicken parm! So comforting.